This seminar seeks to provide insight in to the many challenges facing us in relation to the digitalised times that we live in. In particular, it will give focus on the impact that fast-paced, technological advancement is having on the next generation and some of the ways in which we can overcome these challenges. 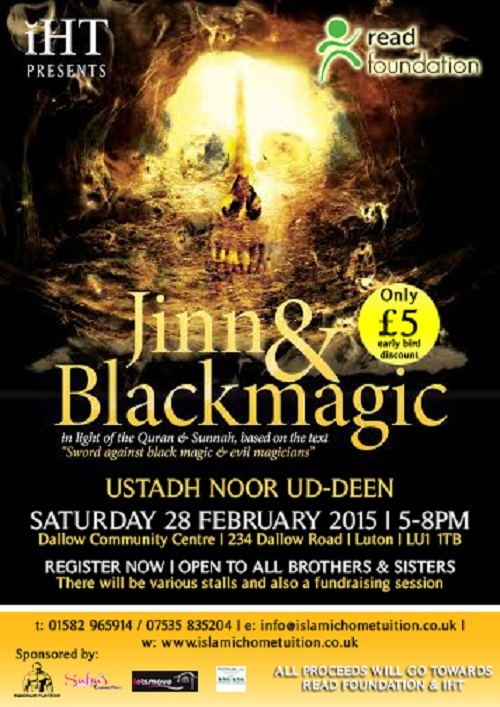 This event has been designed to provide insight into the very contemporary and controversial issue of jinn and blackmagic. 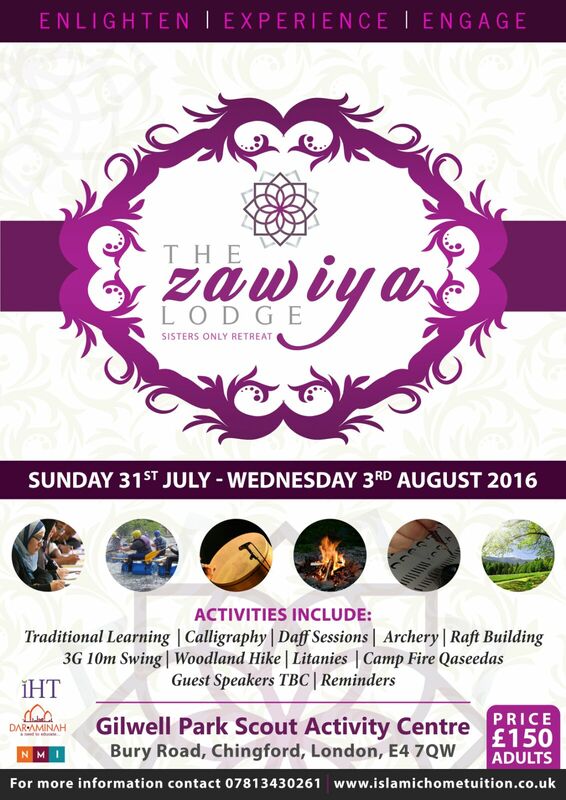 The hope is to provide authentic education based on the Noble Quran and the Sunnah. Students will have an opportunity to ask questions regarding the subject. Take on this fantastic 10-mile trek to the summit of the highest mountain peak in England and Wales. The climb itself is exhilarating, challenging and scenic to say the least. However the aspect of this trek, that will provide both tranquility and joy, is the changing of another human-beings life. 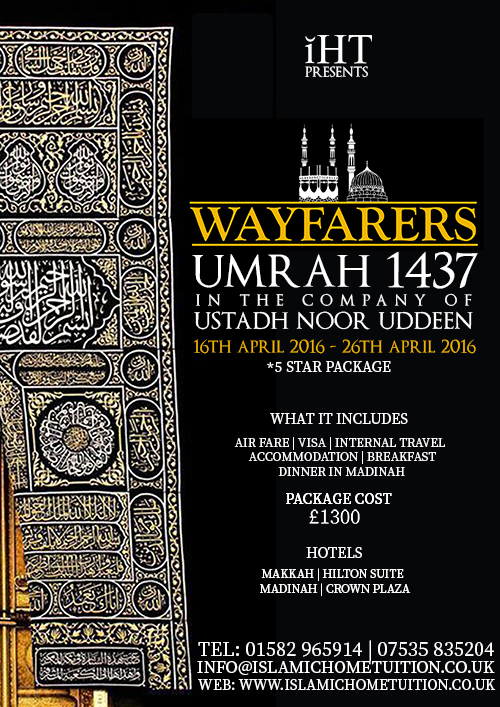 Umrah is one of the best supererogatory actions that can be performed in Islam and Muslims around the world give great significance to this lesser pilgrimage. Even though this type of pilgrimage is not obligatory like the pilgrimage of Hajj, Muslims give much value to this pilgrimage due to the many rewards that can be gained by performing it. 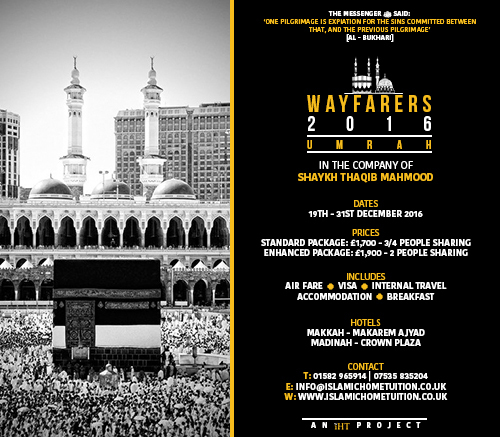 Umrah can be undertaken at any time of the year by leaving for the holy city of Makkah - millions of Muslims visit the city all year round. 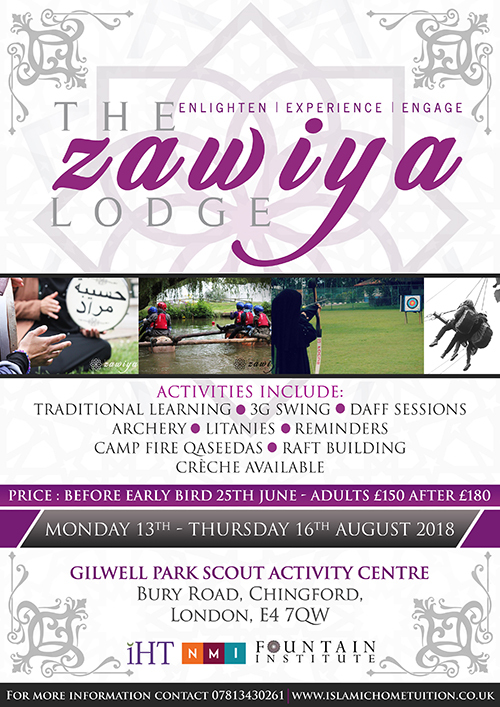 The Zawiya comes to you for the first time, an all sisters retreat aimed to provide a spiritual atmosphere through traditional learning, routined litanies and uplifting gatherings. Also, sisters will engage in adventurous activities enabling stronger bonds and nothing less than an exciting experience! 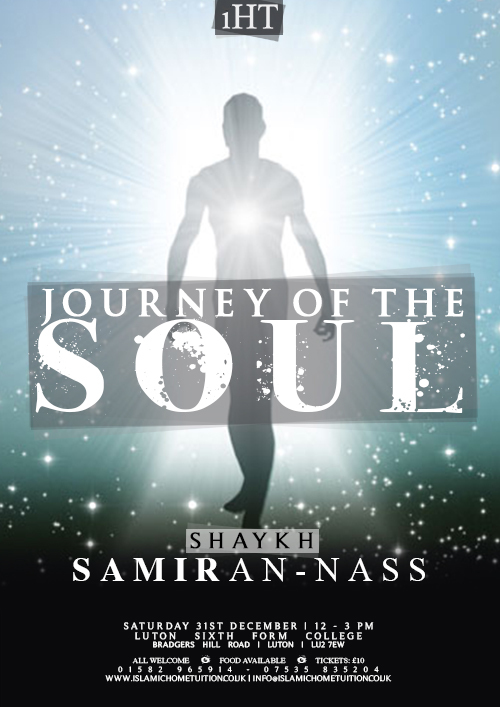 This lecture will be a great opportunity for attendees to study the journey of the soul with one of the worlds renowned Islamic educators, Shaykh Samir an-Nass. 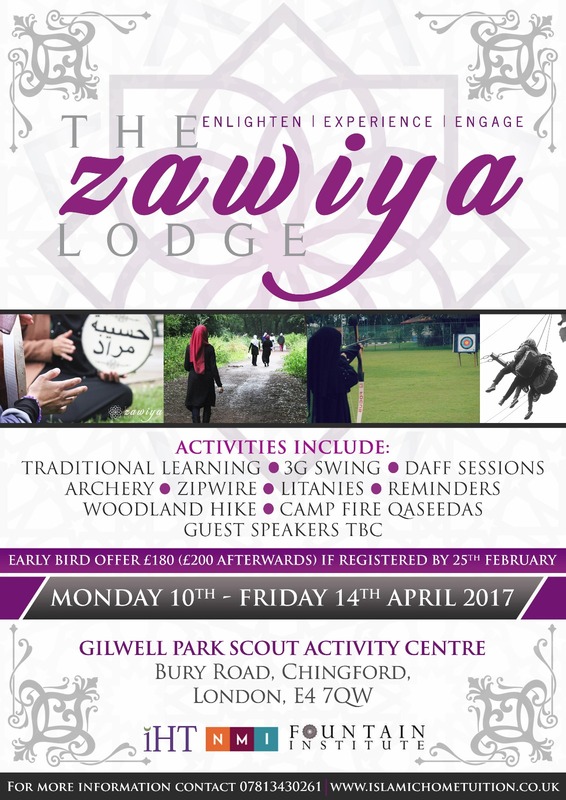 A sisters retreat aimed to provide a spiritual atmosphere through traditional learning, routined litanies and uplifting gatherings. Also, sisters will engage in adventurous activities enabling stronger bonds and nothing less than an exciting experience! 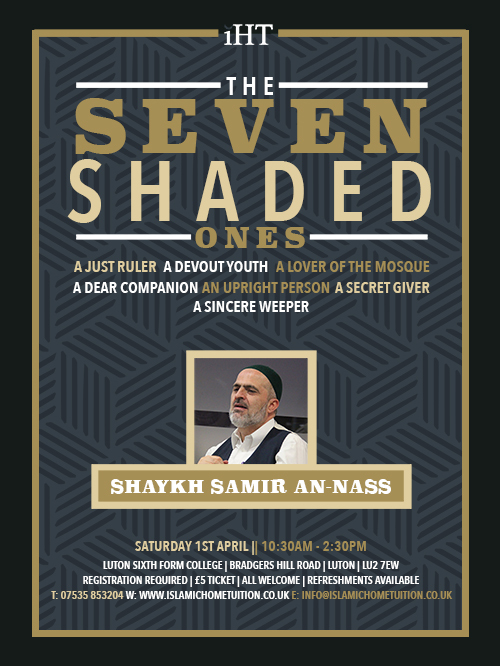 A detailed explanation of the Tradition of the Messenger of Allah (s) which describes the seven groups of individuals that will be shaded on a day where there will be no shade except Allah’s. 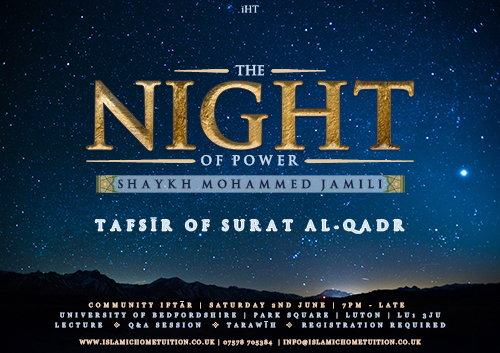 A brief lecture providing insight into the exegesis of Surat al-Qadr. The objective of this talk is to clarify any misconceptions surrounding this phenomenal night and give us ways to prepare for it appropriately. A brief lecture on the relationship between the closest women and children around the Beloved ?. 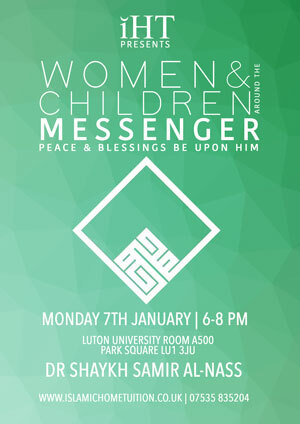 The aim of this talk is to provide listeners insight into how the Messenger of Allah ? conducting himself in these relationships and the manner in which he was able to spare time for everyone.